Go to original pattern for design DROPS 199-8. 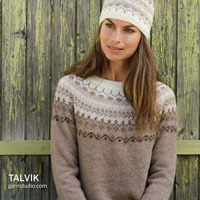 13 stitches in width and 15 rows vertically in stocking stitch = 10 x 10 cm. DROPS CIRCULAR NEEDLE SIZE 7 mm, length 80 cm for stocking stitch. DROPS CIRCULAR NEEDLE SIZE 6 mm, length 60 cm for rib. 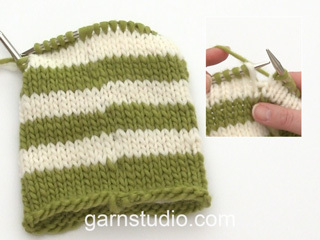 Work stripes in stocking stitch. 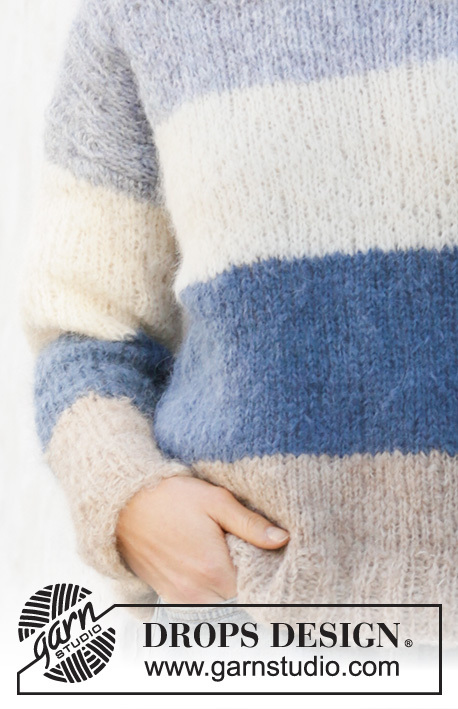 Cast on beige, work stripes upwards, work every stripe for 13.5 – 14 – 14.5 – 15 – 15.5 – 16 cm, after beige switch to dark jeans blue, then off white and then finish with fog. 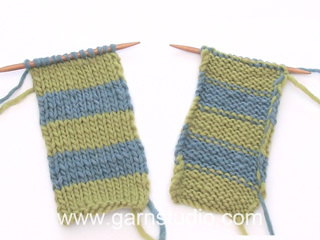 Work stripes in stocking stitch. Cast on with fog and work 2 cm. Switch to off white and work stripes downwards, work every stripe for 13.5 – 14 – 14.5 – 15 – 15.5 – 16 cm, after off white switch to dark jeans blue, then finish the piece with beige. Worked in the round on circular needle up to armhole, then work front and back piece back and forth separately. Work sleeve top down to make it easier to adjust the length of the stripes. Work the jumper in stripes. Cast on 144-152-164-176-192-208 stitches on circular needle size 6 mm - for colour see STRIPES in explanation above. Knit 1 round, then work rib = knit 2/purl 2. Work rib for 7 cm. Switch to circular needle size 7 mm, and work 1 round in stocking stitch while decreasing 12-12-12-12-12-12 stitches evenly = 132-140-152-164-180-196 stitches. Continue in stocking stitch. When piece measures 37-38-39-40-41-42 cm, work only over the first 66-70-76-82-90-98 stitches on needle, slip the last 66-70-76-82-90-98 stitches on a stitch holder. = 66-70-76-82-90-98 stitches. 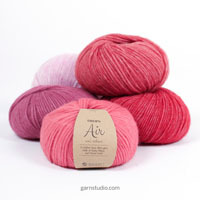 Continue in stocking stitch and stripes. 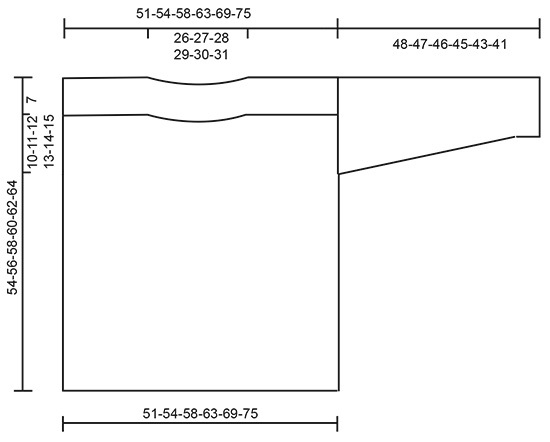 When piece measures 46-48-50-52-54-56 cm, slip the middle 32-32-34-34-36-36 stitches on a stitch holder for neck. Knit 1 row from right side over the first 17-19-21-24-27-31 stitches (until stitch holder), turn, purl the first 2 stitches together and purl the rest of row. Slip stitches on a stitch holder. Knit 1 row from right side over the last 17-19-21-24-27-31 stitches on row, turn and purl 1 row from wrong side, at the end of row purl the last 2 stitches together. Slip all stitches back on needle, and knit 1 row from right side and pick up 2 stitches in each side (between stitches for neck and stitches for shoulder) towards the neck = 68-72-78-84-92-100 stitches. Purl 1 row from wrong side while increasing 6-6-4-6-6-6 stitches evenly = 74-78-82-90-98-106 stitches. Work as follows - from right side: Knit 2, * purl 2, knit 2 *, repeat from *-* the entire row. Work rib for 7 cm, piece measures approx. 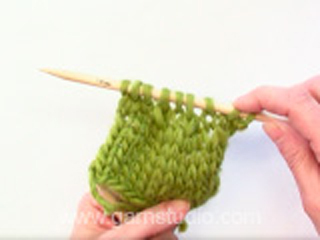 54-56-58-60-62-64 cm, then loosely cast off with knit over knit and purl over purl. Work piece in the round on double pointed needles and work sleeve top down to make it easier to adjust the length of the sleeves. Loosely cast on 44-46-48-50-52-54 stitches on double pointed needles size 7 mm - for colour see STRIPES in explanation above. After 2 cm begin to decrease mid under sleeve by knitting 3 stitches together mid under sleeve - repeat this decrease 8-9-9-10-10-10 times in total every 5½-4½-4½-4-4-4 cm. = 28-28-30-30-32-34 stitches. When piece measures 41-40-39-38-36-34 cm, work 1 round while increasing 4-4-6-6-8-6 stitches evenly = 32-32-36-36-40-40 stitches. 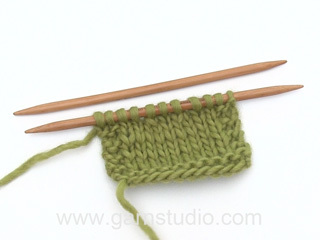 Switch to double pointed needles size 6 mm and work rib (knit 2/purl 2) for 5 cm = approx. 48-47-46-45-43-41 cm. NOTE! Shorter measurements in the larger sizes because of wider shoulders. Cast off with needle size 7 mm to avoid a tight cast-off edge. Sew shoulder seams, leave approx. 26-27-28-29-30-31 cm for neck. Sew in sleeves.